Yasue Ishikawa had a photo seminar of DESINER SHOW HOUSE in NY she visited this year. We are all really excited about the event! from September 19th to October 4th. Kobe from September 19 to November 23.
" Collector’s room exhibition ". 4 designers, and also we open the weekend market. Donation destination, was decided to artsproject. JAIFDA Japan was participated in Interior Trend Show 2013 which was held in TOKYO BIGSITE from October 23 to 25. Each designers exhibited the upcycled chairs at this show. This event was the second event of "Take a seat" which was held in Sangetsu Showroom in May. Pleae look at the all designer's information of TAKE A SEAT at Sangetsu Showroom. There were so many beautiful and interesting chiars. You can see the photos from this website as below. got "intermedia-globe GOLD" prize and the "intermedia-globe SILVER" prize!! Please be so kind as to confirm receipt of this notification.Thank you! will talk about "Let's enjoy the party" at DIKO showroom. IFDA chapters in San Diego, San Francisco, New York, and Osaka, Japan are pleased to announce the first international, simultaneous design exhibition. This exhibit, called Take a Seat, will feature up-cycled chairs creatively redesigned by area members of the furnishings and design industry. Proceeds will benefit Japan Tsunami Relief, Hurricane Sandy Relief and chapter professional development. The exhibition will be open to the public and will commence on the same day in all locations, will run simultaneously for 10 days, and will conclude on the same date with a gala event where all the chairs will be sold to raise funds for these projects. Current time frame is May 7-17, 2013. A kick-off party via Skype between all the participating chapters will be the opening event. The Take a Seat show will be a forum to display both the multiple talents of IFDA members and other top industry professionals and the sponsor products sold in the exhibition locations. The viewers will be asked to cast a vote for their favorite, and one chair at each location will be selected as “People’s Choice” and the designers will receive an award at the gala. The gala will be open to the public and the chairs will be auctioned off to the highest bidder. International vendors are invited to join as sponsors at varying levels to enhance and promote international trade with the furnishings and design industry members. The international sponsors will be featured in all media in all locations. Local vendors will also have an opportunity to participate as sponsors and will be featured in local media. IFDA has initiated a foreign exchange program for members to promote business and travel between the U.S. and Japan to participate in professional symposiums, market events, show houses, etc. For Take a Seat International Sponsorship Opportunities contact Karen C. Wirrig, FIFDA, 2013 President, IFDA-SoCal Chapter at IFDA, 3288 Adams Ave, #161453, San Diego, CA 92176 1-602-321-9154 •karen@karencoledesigns.com. For New York area information, contact Maureen Klein, IFDA, at 516 482-7790 or getklein@optonline.net. for the first-ever simultaneous international design exhibition. Here’s your chance to participate! IFDA chapters in Japan, California and New York will hold an international, simultaneous design event to display chairs made or decorated by industry professionals and students who have up-cycled existing chairs or materials into one-of-a-kind works of art. These chairs become art projects or sculptures in some cases while others can still be used as a furniture piece. Your display space will be limited to the size of a standard side chair. After that, just be creative! This event will run on the same dates in all areas and will be promoted internationally. These chairs will be on public display for 10 days during which time viewers may vote for People’s Choice and the winner at each location will receive an award. At the close of the show a gala will be held and all chairs will be sold. The funds raised will support Japan Tsunami Relief, Hurricane Sandy Relief and professional development for the participating IFDA chapters. Participating designers will receive recognition for themselves and their company in both print and online media and pictures of all the chairs will also be featured online. Every registered designer or team will be asked to provide one head-shot or group photo. One company logo may also be submitted. along with a 100-word description of your company and a “before” shot of the chair you will use. This event registration is limited to the first 25 submissions for each location, including IFDA members, other industry professionals (non-members), art, architecture, design students and even design school programs (as a group with a single entry). Registration fee: $75 (non-refundable) reserves one space for your custom chair creation, invitation to the kick off party, and admission for one to the gala closing event. Completed chairs must be ready to be delivered to the display location up to one week prior to the kick-off date. Exact delivery details will be emailed to the participants along with their confirmation that they are included in the event. Watch for the official IFDA member international kick-off registration posting coming soon. IFdA Japan chapter held "Thanks to Venders Party" of Designer show house 2012. We had a wonderful time together with designers and venders who cooperated for Designer Show House 2012. Inventory of donation ceremony to "Tono Magokoro net" was held. We donated 500,000yen to "Tono Magokoro net", Network Disaster Relief Tono. The Tono is a group of volunteers was formed around the citizen to assist the people of the victim of the coastal Iwate Prefecture affected by the Great East Japan Earthquake that occurred on March 11, 2011. We also did the SKYPE to connect to IFDA NY Chapter and held the Donation ceremony for the reconstruction of the hurricane "Sandy" attacked NY in October 2012. Ms. Maureen Klein of IFDA NY Chapter is in the screen! We informed about the next Big event "TAKE A SEAT" to the guests. 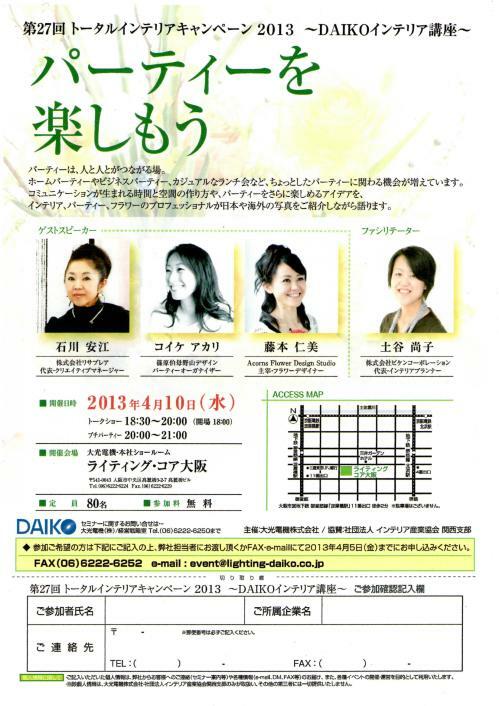 IFDA Japan recently held their 2012 Designer Show House: FUNdamentals of Work. Below, celebrating the achievement at the closing party.